Today the Junior classes had their Open English Lessons. Class 1 did a fantastic job in front of many mums and showed everyone their great confidence to use English. Mr. Chris wanted to show the class the new Class 1 restaurant he had prepared, but, oh no! He forgot to get the food! The children helped to identify the different food and the different countries they were from, China, the USA, Italy, India and France. 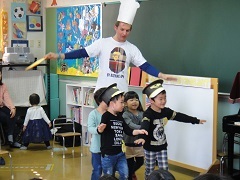 The children then pretended to fly airplanes whilst wearing their pilot hats to go to the different countries to collect the food needed for the Class 1 restaurant. Everyone is looking forward to opening the restaurant up next month. Well done everyone. Class 2 and 3 did excellent in their Open English lessons as well. 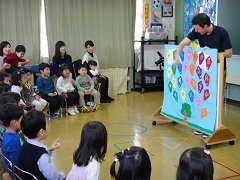 I was so impressed by how much English the children could speak in front of their parents. Everyone did great remembering winter actions and the songs we did like “Skidamarink”. During our main activity the children helped Mr. Shay make sandwiches with ingredients of different shapes. 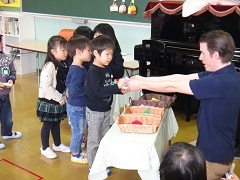 The children could say shapes, ingredients, and phrases like “circle tomatoes”, “square ham”, “triangle lettuce”, and “rectangle cheese”. This was a great opportunity for the children to have fun and show all that they have learned this year. Great job, kids and thank you for coming, parents.